One plant that deserves a spot in every drylands herb garden is the chocolate flower, Berlandiera lyrata, one of the more attractive of the many yellow flowers found in the Sonoran Desert. When in bloom, its yellow petals, with striking red veins on their lower surface, surround a deep maroon center. At the base of each flower head is a whorl of broad green bracts that remain after the petals drop, giving the plant another of its common names, “greeneyes”. And yes, chocolate flower does indeed have the aroma of chocolate, particularly in the early morning. Pulling the petals from the flower head releases the distinctive fragrance, and the stamens have a chocolate flavor when eaten. The chocolate flower is in the sunflower family, or Asteraceae, and as such it has an unusual floral structure. There are actually two different types of tiny flowers (florets) that make up what we see as a single flower with its array of petals. Each of these petals has a very small reproductive structure attached at its base. At the center of this ring of petals are numerous small disc flowers arranged in a spiral formation. 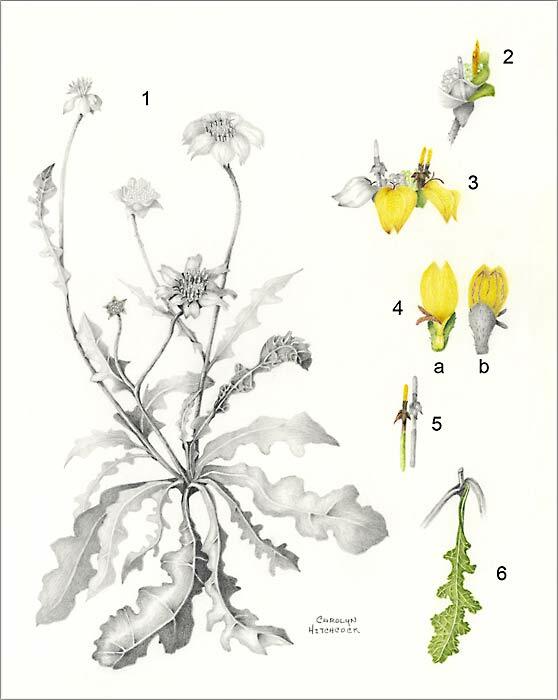 The sectional diagram shown here by Lucretia Hamilton provides a simple outline of how these two types of flowers are arranged. 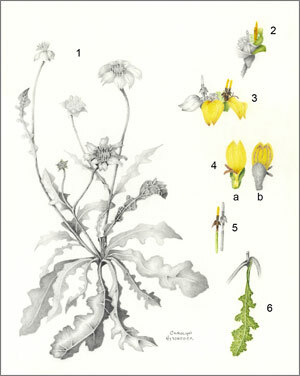 Next to this diagram is a botanical illustration of Berlandiera lyrata by Carolyn Hitchcock that is one of the artworks in the Sonoran Desert Florilegium. In Carolyn’s drawing, the growth habit of the plant (Fig. 1) is presented in graphite and shows single flower heads supported by long stems growing from a cluster of basal leaves. To the right are enlargements of the floral structures presented in a combination of graphite and colored pencil. 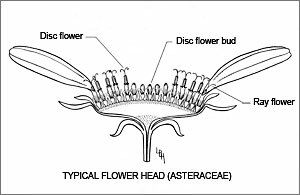 Looking at a flower head from the front (Fig. 3), you can see the yellow ray flowers with the dark maroon disc flowers standing behind. A complete ray flower is shown in Fig. 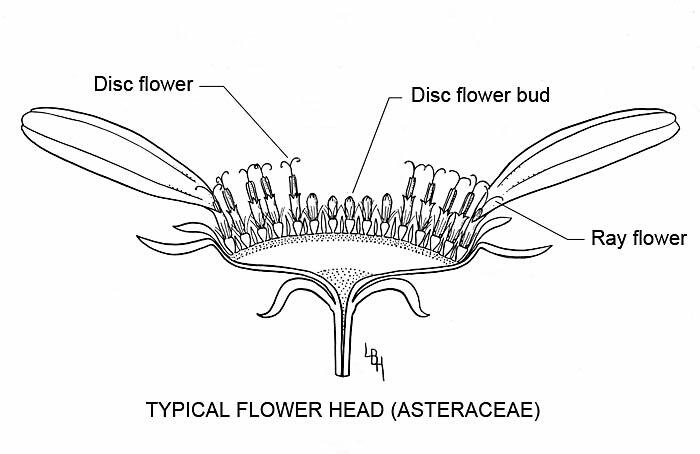 4, with both the upper (a) and lower (b) surfaces, and an enlarged disc flower is shown in Fig 5. The habit and Fig. 6 show the deeply-lobed, lyre-shaped leaves of the plant that are referenced in the species epithet, “lyrata”. The genus Berlandiera was named by the Swiss botanist Augustin Pyramus de Candolle to honor Jean Louis Berlandier (ca. 1805–1851), a fellow botanist, physician, and plant collector. In 1826, Berlandier was sent to Mexico by a group of botanists in Geneva, including de Candolle, to collect plants in the state of Coahuila y Tejas, a part of Mexico where there had been little botanical exploration. Over the next five years, Berlandier sent some 52,000 plant specimens back to Geneva. While making these collections, Berlandier served with the Comisión de Límites (Boundary Commission), a scientific and surveying expedition into Texas that resulted in the recommendation in 1828 to stop the United States from acquiring Texas. After serving on the Commission, Berlandier settled in Matamoros and worked as a physician and pharmacist while continuing his plant collecting. During his time in Mexico, he saw the Texas Revolution, the annexation of Texas by the U.S., and the resulting Mexican-American War. In the midst of these events, he compiled considerable botanical, zoological, and ethnological information gathered on his expeditions, complete with very competent illustrations. In 1851, Berlandier died while attempting to cross the swollen San Fernando River near Matamoros. This appeared in the February 2017 issue of The Desert Breeze, the monthly newsletter of the Tucson Cactus and Succulent Society.